Talk about iconic species at Yellowstone National Park and you’ll most likely start with bison. So tightly are these animals tied to the national parks that they’re even on the Interior Department’s emblem. 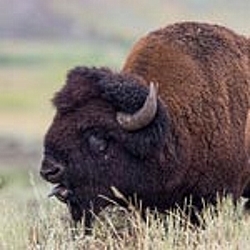 But Yellowstone bison also are controversial. Many of these shaggy animals head out of the park in winter and roam into Montana. That can be a problem, as some in Montana’s livestock industry fear bison will transmit brucellosis — a disease that can cause cows to abort their fetuses — to their herds. Since 2000, the Interagency Bison Management Plan has governed how the park’s bison will be managed in and out of the park. Now state and federal agencies with connections to Yellowstone are working to craft a new approach. Everything likely will be on the table as that effort moves forward, including the park’s work to maintain its bison population at a specific number. The National Parks Conservation Association along with other regional and national organizations earlier this spring sent a letter to Montana Governor Steve Bullock and Yellowstone Superintendent Dan Wenk outlining important areas of consideration for the development of the new plan. Those groups hope a solution can be found to killing hundreds of bison that leave the park during the winter months. You can lend your thoughts to the process, too, as a public comment period on aspects that should be covered in an environmental impact statement are being accepted into June. To comment, visit Yellowstone National Park’s website (www.nps.gov/yell) click on the “Get Involved” link in the left hand column, and then on the “Planning” link.